Doomsword is a cult band that take the listener back to ancient times with their new album. 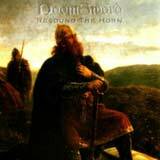 Resound the Horn is a journey to ancient days with its many references to history and Viking gods as well as overall medieval and celtic tones. Musically speaking, this album carries an overall doom vibe throughout. You will hear many dark and slow, yet crunchy riffs that will instantly remind you of early Black Sabbath. The guitar tone reminds me very much of the latest Tad Morose album, Matters of The Dark which also has doom overtones. The songs are epic in nature with only seven songs spanning fifty minutes. Perhaps the biggest highlight of this album is the above average guitar work. You will find numerous dual guitar leads as well as a plentiful supply of long, epic solos nested within each song. The riffs are slow, yet forceful and crunchy as hell. Some outstanding work on the bass guitar gives the songs a very well rounded sound on the low end. The strong bass level accentuates the doomy feel very well on this album. As for the production, the drums sound a bit too raw and muddy from time to time, but the guitar work manages to come through very clear and deliberate. The lead vocals are not bad, but they are quite average in my opinion. You will not hear any out of tune moments, but I feel that his voice is not dynamic enough for the epic style of the band. He reminds me a bit of an unrefined and raw Hansi Kursch of Blind Guardian (especially in Onward Into Battle and The Doomsword). Don't get me wrong, each of the songs are sung very well, but I can't say that the vocalist adds a lot of excitement or emotion to the songs. I think the right producer would be able to help correct some of the raw and unrefined qualities in the vocal department. That combined with a more varied vocal delivery will certainly help in the future. I don't think the band needs a new vocalist since a more varied approach and the right producer could really make this guy shine on the next album. For me, the vocals take a backseat on this album to the really nice guitar work on this album. Overall, this is a solid album with an interesting theme. When I first saw the front cover, I rolled my eyes and thought this was just another "warrior off to fight the battle of heavy metal" type of albums. Fortunately, the subject matter is more thoughtful than that with its historical and Viking references. I really enjoy the guitar work and epic feeling a lot on this album, but the lead vocals and the production keeps this album in the "average" category for me.